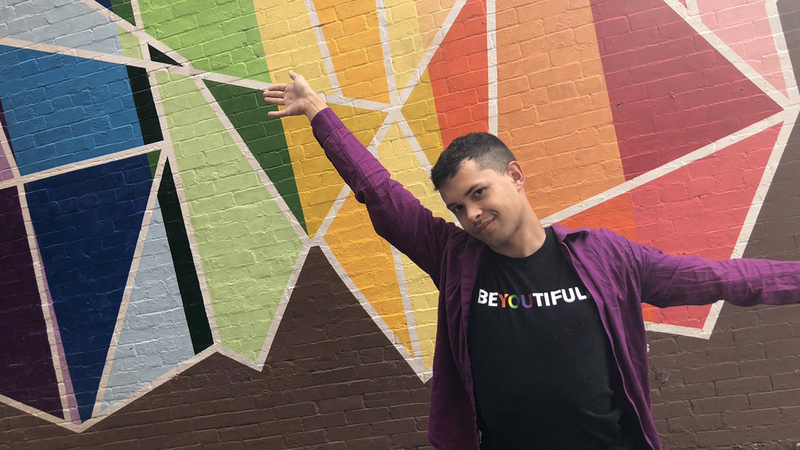 This National Adoption Month, HRC sat down with Roddy Biggs, an HRC Foundation Youth Ambassador from Knoxville, Tennessee, to learn about his experiences with foster care and adoption as a young LGBTQ person. Biggs, who uses both he/him/his and they/them/theirs pronouns, is a proud LGBTQ advocate working to end bullying and suicide. Biggs transformed their negative experiences after coming out as gay at age 12 into action, going on to lead both his high school and college GSAs. He now works to promote the message that it’s important to never give up. As you prepare to finish your time as an HRC Foundation Youth Ambassador, tell us about your experiences with the program. My experience as an HRC Youth Ambassador has been truly life-changing. As I look back on the work I have done, I am blown away by not only all that I have achieved, but who I have become as a person. I found a new family at HRC and a new outlook for myself and the world around me. I am honored to have had such an opportunity to learn and grow alongside some of the most amazing people I have ever known, and I look forward to seeing where life takes me. This November, we celebrate National Adoption Month. Can you tell us a little bit about your experiences with adoption as an LGBTQ person? I was adopted at a very young age after being in the foster care system as a baby. Luckily, when I came out as gay at the age of 12, my adoptive family was mostly supportive of who I was. In time, they learned to embrace my queer identity. What’s your message to child welfare providers who want to support LGBTQ youth but might not know where to start? Reach out to HRC for help. HRC has tons of research, resources and even programs in place that can help you get started. LGBTQ youth, like all the other youth you work with, are just kids who are longing to be seen, heard and loved -- and it’s your job to make that happen. What’s your message to other young LGBTQ folks who have been or hope to be adopted? My wish for you is that you know you are loved, and that there are people like me who care for you. If you ever need help, know that there are folks all over the world, including HRC, who can and will be there for you to help point you in the right direction. Don’t give up, stay strong and remember that you are beyond beautiful just the way you are. The HRC Foundation Youth Ambassadors are a group of inspiring young people from across the country who show courage in sharing their stories and demonstrate a commitment to speaking out about issues facing LGBTQ youth. As Youth Ambassadors, they represent the HRC Foundation, using their voices to raise awareness about HRC’s youth-focused programs. Learn more.